This set includes just about every piece of cookware you’ll need to start your kitchen, including a 12-inch shallow grill pan that you won’t find in other sets. The hard-anodized aluminum pans heat quickly and evenly, and the coating is durable enough for you to use metal utensils in the pots. The handles have a silicone grip that’s comfortable to hold and slip-resistant. And the cookware is oven-safe to 400 degrees. The gray-colored exterior is attractive and will likely match most kitchens. This set includes a 1 1/2 quart saucepan with lid, a 3 quart saucepan with lid, and 8 quart stockpot with lid, an 8 inch skillet, a 10 inch skillet, a 3 quart sauté pan with lid, and a 12-inch shallow grill pan. The lids are break-resistant glass so you can see what’s cooking without opening the lid and letting the heat out. While this includes a large variety of pans, the set might be too large for someone starting out with a small kitchen with limited storage space. These cannot be used on induction cooktops. They should be hand washed. 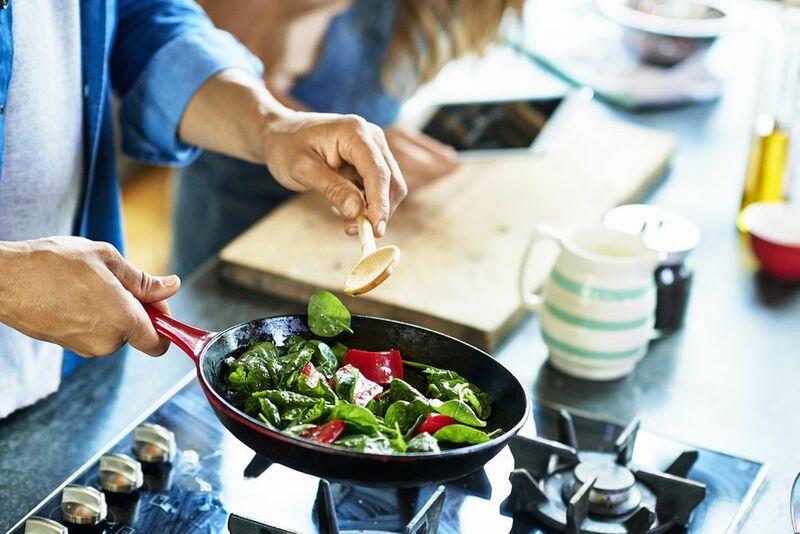 While nonstick cookware is great for keeping foods from sticking to the pan, that same quality means that it’s not quite as good at searing meats, but the nonstick surface in this pans has been engineered to perform as well as stainless steel. The surface is also tough enough so you can use metal utensils when cooking. The pans are made from hard anodized aluminum and have long stainless steel handles that stay cool during cooking. Both the pans and the tempered glass lids are oven safe to 500 degrees, and are also dishwasher safe. The set includes a 10 inch omelette pan, a 12 inch omelette pan, a 2 quart saucepan with lid, a 3 quart saucepan with lid, a 3 quart sauté pan with lid, and an 8 quart stock pot with lid. The 3 quart saucepan, 3 quart sauté pan, and 12-inch omelette pan all have helper handles to make them easier move. These cannot be used on induction cooktops. This set has a distinctive coloring, with a gray exterior, stainless steel accents, and cranberry red handles, so they look both classic and a little playful. The pans are hard anodized aluminum for quick heating and the nonstick coating releases food easily. While a 12-piece set sounds huge, this count includes utensils that match the color of the handles. With this set, you’ll get a 1 quart saucepan with lid, a 2 quart saucepan with lid, a 6 quart stock pot with lid, an 8 1/2 inch skillet, a 10 inch skillet, a 3 quart sauté pan, a slotted nylon turner and a nylon spoon. The lids are made from shatter resistant glass, so you can watch what’s cooking without lifting the lid. The pans are oven safe to 400 degrees and are dishwasher safe. They cannot be used on induction cooktops. While the saucepans are smaller than those in some sets, the stock pan and sauté pan have a more generous capacity. This set is also available with blue or orange handles and accessories. This basic and very affordable cookware set includes a few extras, including a griddle pan and nylon tools. Made from heavy-gauge aluminum with a black exterior, they have a proprietary Thermo-Spot indicator in the center of the pans than shows when the pan is preheated properly. The handles are heat-resistant and designed to be comfortable to hold. The pans are oven safe to 350 degrees and they are dishwasher safe. The lids are made from tempered glass and have a vent hole to release steam during cooking. The set includes a 7 3/4 inch frying pan, an 11 inch frying pan, a 1 quart saucepan with lid, a 2-quart saucepan with lid, a 5 1/2 quart Dutch oven with lid, a 10 1/4 inch griddle pan, a spoon, a ladle, and a slotted spatula. These cannot be used on an induction cooktop. This set is also available in red, if you prefer a bit more color in the kitchen. This cookware set is made from aluminum with a proprietary ceramic/titanium coating that’s nonstick and durable, while the cookware is lightweight and easy to handle — you can even use metal utensils without worrying about damaging the nonstick coating. The cookware is dishwasher safe for easy cleanup after dinner, and it is oven safe to 500 degrees. The included lids are made from tempered glass, and the handles on the lids and cookware are designed to stay cool in use. The lids create an air-tight seal during cooking, sealing moisture in. The set includes a 1 1/2 quart saucepan, a 2 1/2 quart saucepan, a 5-quart stock pot with a steamer tray, an 8 1/2" skillet, a 10 1/2" skillet. Four lids are included – one fits both saucepans, one fits the stock pot, and one fits the 10 1/2" skillet. 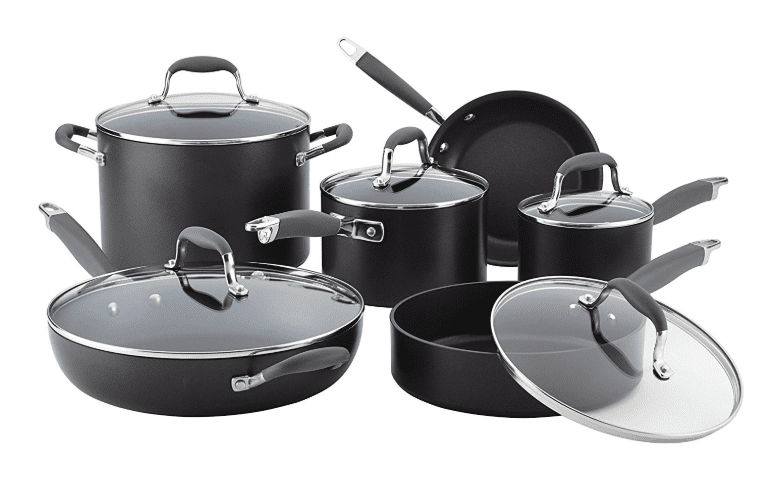 This set is ideal for someone setting up a new kitchen, and particularly good for singles, since the pan sizes are slightly smaller than you’ll get in other sets. An added bonus is the baking sheet, so you’ll be ready to make cookies or roast some vegetables in the oven. Five nylon cooking tools are also included, so that’s less shopping to do. The bright blue exterior adds some color to the kitchen and the black nonstick interior releases food easily. This cookware is dishwasher safe for super easy cleaning. The lids are shatter resistant glass so you can check the cooking process without letting the heat out. The cookware is oven safe to 350 degrees and the baking sheet is oven safe to 450 degrees. The set includes a 1 quart saucepan with lid, a 2 quart saucepan with lid, a 5 quart Dutch oven with lid, an 8 inch skillet, a 10 inch skillet with lid, a medium baking sheet, and 5 nylon kitchen tools (spoon, spatula, whisk, spaghetti spoon, and slotted spoon). Since this cookware is made from aluminum, it cannot be used on an induction cooktop. This set is also available in other colors. This cookware set includes extras that make it the perfect starter set, whether it’s for a new apartment or a vacation cottage. The patterned nonstick coating helps keep food from sticking and makes cleaning easy by hand or in the dishwasher, and the tempered glass lids let you see what’s cooking without lifting the lid. This set is available with either a red or black exterior. Made from aluminum, it’s lightweight and easy to handle, yet heats quickly and evenly. Stay-cool handles let you move the cookware on the stove without pot holders. This is not compatible with induction cooktops. The set includes an 8-inch sauté pan, a 9-inch deep sauté pan, an 11-inch griddle, a 1-quart saucepan with lid, a 2-quart saucepan with lid, a 3-quart saucepan with lid, a 4-quart Dutch oven with lid (which also fits the deep sauté), a folding stainless steel steamer, a solid spoon, a slotted spoon, a solid turner, a slotted turner, a pasta spoon and a ladle. We bought two top-rated nonstick cookware sets that our reviewers tested for 32 hours. We asked our testers to consider the most important features when using these sets, from their size to their price. We’ve outlined the key takeaways here so that you, too, know what to look for when shopping. Number of pieces Is a large set better than a small one? It really depends on your cooking style and your family size. More pieces give you more versatility, but that also means you need more space to store your new cookware. Do you really need three or four saucepans in different sizes? Maybe you do. Sizes It’s always a good idea to check the sizes of the pots and pans in a set to make sure you’re getting items you’ll use. A large family might never need a tiny frying pan, but they might need a giant stock pot for big batches of soups. You can always buy extra pieces to add to your set, but if your set contains two or three pans you’ll never use, it’s not a great bargain. Extras Some cookware sets include extra pieces, like spatulas, spoons, and other non-cookware items. Those are a great bonus if you’re setting up a new kitchen and you need them, but if you already have a fully equipped kitchen, those extra pieces will just eat up storage space. “This cookware set is heavy, shiny, and beautiful—it has all of the elements of great craftsmanship,” gushed one of our testers. Our reviewers particularly liked the clear tops and the fact that they were oven safe, with one of our testers noting the thickness of the pans “ensures even heat distribution all around.” While there weren’t many negatives, according to our reviewers, one of our testers didn’t like that the smaller handles got hot and also noticed that the pans scratched easily. Overall? “This is the type of cookware that lasts long, so it ultimately ends up being worth the extra money,” declared one of our reviewers.